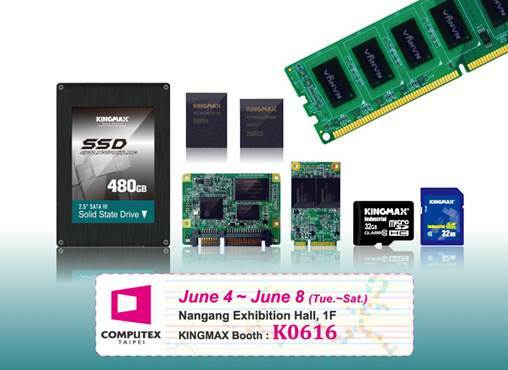 Computex 2013 will hold during June 4th to 8th in Taipei, and KINGMAX will demonstrate its series of industrial grade of FLASH storage products—SSD, eMMC/eMCP, SD/CF cards and DRAM. Leveraging more than 20 years of DRAM and FLASH expertise in R&D and manufacturing, KINGMAX will exhibit a complete series of industrial solutions which are not only at latest specification but also has been undergone strict reliability test and verification to ensure the most stable quality. “Starting early last year, the company decided to focus its effort on making embedded storage products for the industrial market, which encompasses a wide range of applications, including IPC, digital signage, POS, and kiosk,” Kingmax CEO Joe Liu said, citing higher threshold and higher profit margins as incentives for the strategy adjustment. Kingmax’s lineup of industrial-grade embedded storage products includes 2.5-inch solid state drives, mSATA SSDs, and Half-slim SSDs, as well as JEDEC-compliant eMMC and eMCP solutions for production of small form factor mobile devices and consumer electronics, such as tablets, handsets, smart TVs, car infotainment and navigation systems. Kingmax’s other industrial storage products include industrial SD cards, industrial CF cards and DRAM modules. “The company enjoys the advantage of vertical integration in terms of production process, allowing it to offer industrial customers with products that guarantee better reliability, lower costs and shorter lead time,” Liu said. KINGMAX is actively expanding its industrial solution and deeply cultivating markets of flash drive, memory card, DRAM. Visitors are welcome to KINGMAX Computex booth: K0616, 1F, Nangang Exhibition Hall, to understand more advantages and details of KINGMAX products and solutions.